Tennis ace Stefanos Tsitsipas has all the shots in the book – whether he is holding a racquet or a camera. The Greek sensation took the sporting world by storm following an epic boilover against one of the game’s greats at the Australian Open on Sunday night. The 20-year-old 14th seed is on everyone’s lips after defeating his childhood idol and defending champion Roger Federer to reach his first grand slam quarter-final. But while his ground shots won him a new legion of new fans, the shots he captured with his video camera while in Australia has landed him in strife. Unaware of Australia’s strict airspace laws, he was forced to take down the YouTube video of drone footage he’d taken at the recent Sydney International tournament. ‘I had to delete it for some reasons. 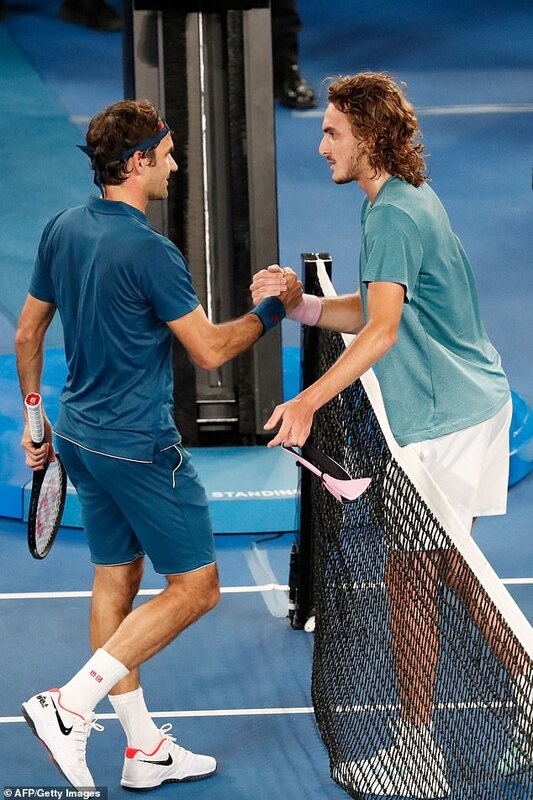 I did realise this footage from Sydney is not allowed, it’s not allowed to fly drones in the city,’ Tsitsipas told reporters in his post-match conference on Sunday. ‘I mean, for the better good, not to get in trouble, I prefer not to have that video online. ‘But it was a very nice video. It took me hours to make. It actually was really spectacular. It was nice to watch. Tsitsipas now faces Spain’s Roberto Bautista Agut in the quarter-finals to book a possible semi-final showdown against world number two Rafael Nadal later this week. Ranked the number one ranked junior in 2016, Tsitsipas is coached by his father Apostolos while his mother Julia Apostoli is also a former world number one ranked junior and had a career-high professional ranking of 194. He is the first Greek player ever to reach the quarter-finals at a slam and last year became the first Greek man to win an ATP Tour title. He had won just over in $2 million in prizemoney prior to the Australian Open. 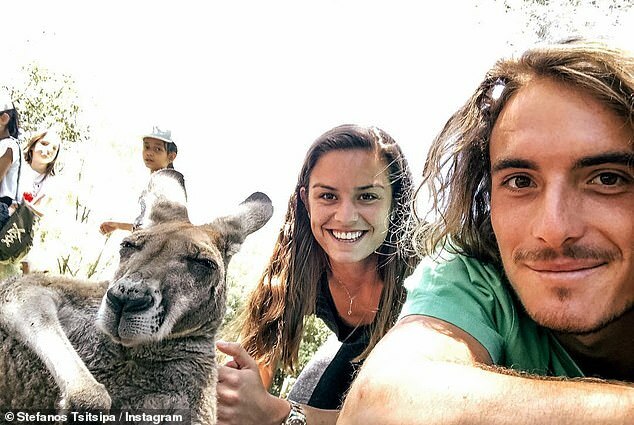 Tsitsipas is very active and popular on social media, where he shows off his passion for photography and film making to his 267,000 Instagram followers, almost 54,700 on Facebook and more than 51,600 on Twitter. His Instagram is filled with posts of his travels around the world on the tennis circuit, photos with tennis legends such as Boris Becker and the occasional throwback snap from his childhood. He’s enjoying his time in Australia with Instagram posts posing with Australian wildlife and attractions such as the Sydney Opera House and Western Australia’s Rottnest Island. 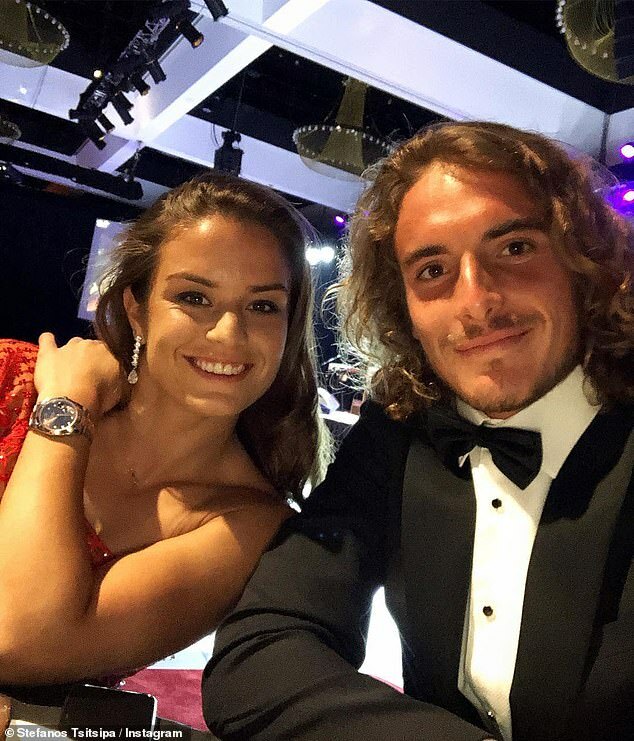 Little is known about Tsitsipas’ love life but many recent Instagram posts feature fellow Greek player Maria Sakkari, who’s three years older, which sparked speculation from followers. ‘Are you two a couple?’ one commented on a photo of the pair from New Years Eve. The pair teamed up to play the Hopman Cup mixed doubles in Perth earlier this month, where they lost their tie against Great Britain, but won against the US and Switzerland. Sakkari also made the third round of the Australian Open before she was knocked out by Australian young gun Ash Barty.